Toy Story quickly became a nation wide classic. I will admit that I was in tears in every movie! Especially the third one, man that was ridiculous. But there is one part in the first movie that literally has impacted my life. Yes my life! There is a scene towards the end, when Buzz and Woody have been captured and taken to the evil neighbor kid's house, Sid. Buzz has been strapped to a rocket awaiting his fate, while Woody, who came to bring Buzz home, is trapped under a crate. This is a major turning point in Buzz's toy life. You remember Buzz's grand entrance to the story, right? He was the coolest kid on the block, or rather the coolest toy in the toy chest. He arrives in Andy's room as a birthday gift, and immediately knocks Woody out of the park with all his buttons and gagets. He doesn't see himself as a space ranger toy. He IS a space ranger. He is important. He has a destiny. He has a mission! (Can't you hear the theatrical narration?) Of course the call-it-as-you-see-it sheriff emphatically informs Buzz he is NOT a real space ranger. He is NOT from another galaxy. He does NOT have a laser beam that shoots from his arm. He can NOT fly. And He is NOT Andy's favorite toy! I love, love, LOVE what Buzz does next. 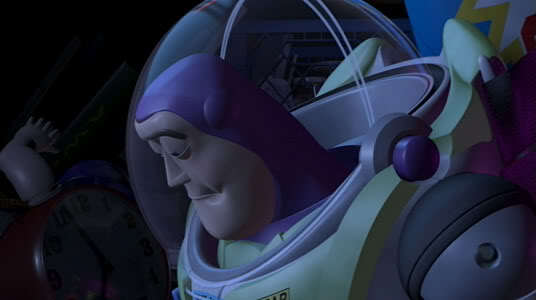 Buzz looks under his boot and sees the name "Andy"
written in permanent marker and realizes, "I belong to someone. 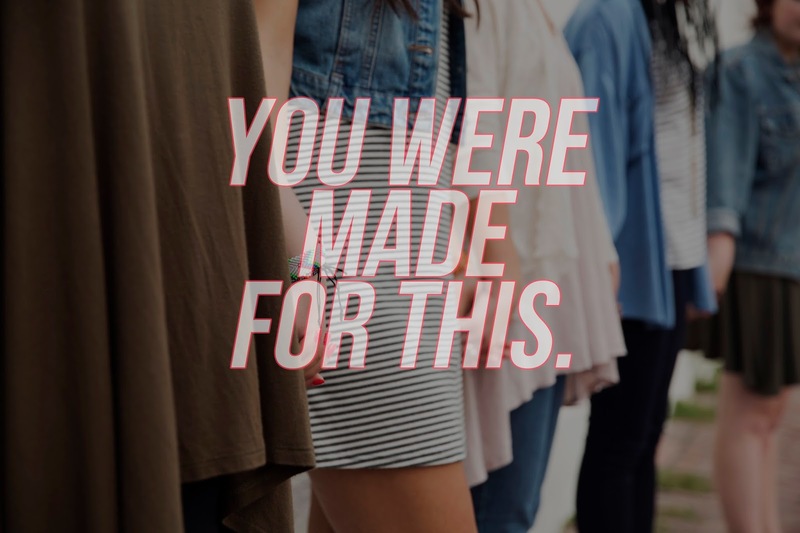 I was made for this." Friend, there may not be permanent marker with God's name on your foot, but I can promise you it is on your heart. It is on there, in PERMANENT ink. Whether we believe it or not, whether we accept it or not, it is there. We belong to Him. And that is not going to change. He so desires for us to stop believing the lie that we are just this or just that. We are just as He made us to be. We are just as He purposed us to be. You are no insignificant thing. You are His masterpiece. You are His daughter. 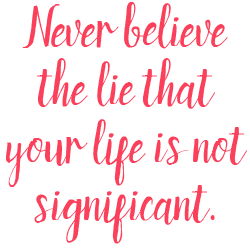 Never believe the lie that your life is not significant. Never believe the lie that your life has no value or purpose. The name that is written on your heart gives you all the significance, value, and purpose in the world. Clearly this is the most profound thing in this movie. Buzz realizes who he belongs to and it changes the end of the story. He doesn't get blown up. Woody is saved. The other toys get their revenge on the evil Sid, and Buzz and Woody get back to Andy. If we ladies can realize who we belong to I know it will change the end of our story as well. 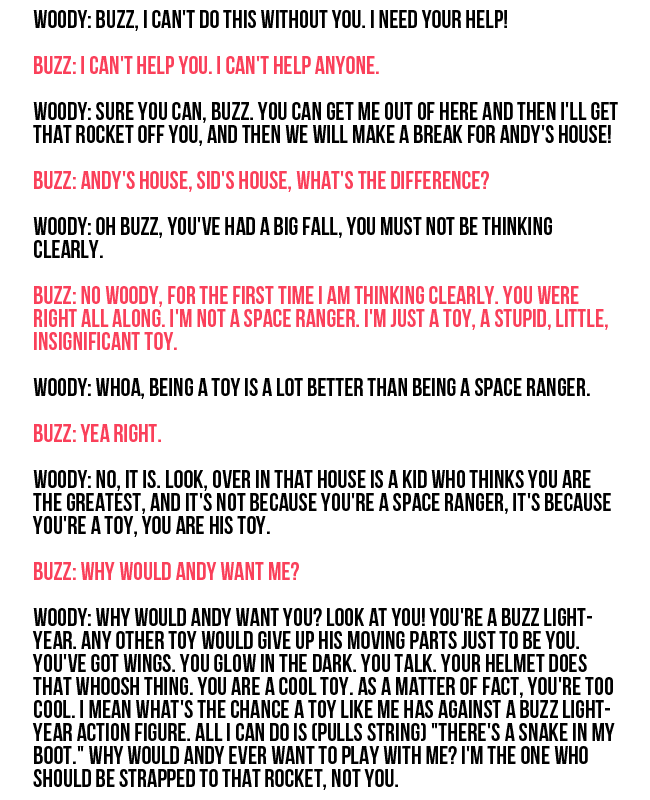 Woody: You are a cool toy. As a matter of fact, you're too cool. I mean what's the chance a toy like me has against a Buzz Lightyear action figure. All I can do is (pulls string) "there's a snake in my boot." Why would Andy ever want to play with me? I'm the one who should be strapped to that rocket, not you. Woody's biggest struggle throughout the movie was the feeling that he was being replaced. It was this competitive... or should I say comparative, spirit that we have all experienced at one time or another. We stop thinking about about how much God loves us and start thinking about why we aren't as lovable as the next girl. We aren't as perfect. Maybe we convince ourself that we have aged out of God's favorites. But sister hear this: you will ALWAYS be your Father's favorite. Always. No matter how old, how tired, how used, how broken, you will always be His favorite. His name will never wear off your heart. You are significant. You are valuable. You have purpose. You are His.